Hong Kong's visible minorities, like everyone else, have their dreams and challenges. For the city's small African population, these are not only evident in their World Cup fervor, but also in their determination and efforts to succeed here. Andrea Fenn reports. It did not matter that in the end Ghana was eliminated in an unfortunate penalty shoot-out that left many with a bitter aftertaste. 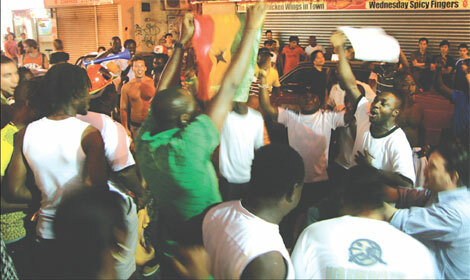 Nonetheless, most stayed out dancing till the morning after, content enough with the pride exhibited by their team on the international stage. That night, the Ghana national team was playing the quarterfinals in the World Cup against Uruguay, the third time in football history that an African team had ever made it that far in a sport traditionally monopolized by Europe and South America. "We are proud not just for Ghana, but for the whole of Africa," said Bashir Mohammad, a businessman wrapped in a Ghanian flag. "We Africans have a very strong sense of fraternity; what is good for one country is good for the whole continent." This sense of fraternity is the same as the solidarity that can be found in the African community in Hong Kong, where different national groups live closely together. According to Adams Bodomo, Associate Professor of Linguistics and African Studies at the University of Hong Kong, African migration in Hong Kong is a silent phenomenon, often overlooked when compared to the bigger immigrant groups from South Asia or the Philippines. "In the official statistics, Africans are often ignored or simply categorized as 'others', but the African population in Hong Kong has reached 15,000 to 20,000, which is a substantial number," says Bodomo. Bodomo's researches about African diaspora suggest that African migration in the city started in the 1970s, and intensified at the end of the 1990s, when the Asian financial crisis severely hit Southeast Asia, and Africans living in former French colonies like Vietnam and Cambodia moved to Hong Kong for better business opportunities. "Now the African community in Hong Kong is very diverse, with different national groups having different cultures, languages and religions," says Bodomo. Africans are based in Tsim Sha Tsui around the big bazaar of Chungking Mansions, where they live elbow-to-elbow with several other minority groups, mostly Pakistanis, Indians and Nepalese. In Chungking Mansions they founded the African Committee of Hong Kong, the first and only government-sponsored organization representing the interests of the African community in the city. Dixon Siddiq, chief organizer of the committee, says the organization was created in December 2009 with the intent to facilitate relations between Africans and local Chinese, and to promote mutual understanding and awareness. "Some people think Africans in Hong Kong are all refugees," says Siddiq. "Instead, only a mere 5 percent of us come here seeking asylum, while the remaining majority are business people." As explained by Siddiq, the main activity Africans in the city engage in is the purchase of mobile phones and electronic devices to sell in African markets. This commerce mostly takes place in Chungking Mansions, where there are more than 200 wholesale electronic shops, all of them catering to African business people. "There are only three shops in Chungking Mansions that are owned by Africans," says Siddiq. 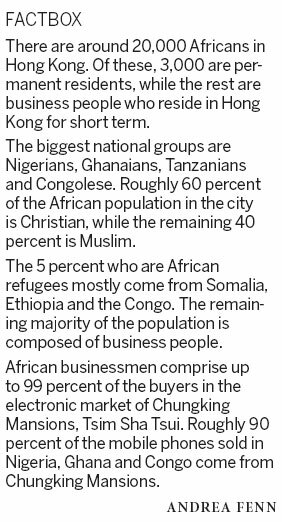 "All the other sellers in Chungking Mansions are local Chinese or Pakistani, while 99 percent of buyers are Africans." According to Siddiq's statistics, more than 90 percent of mobile phones sold in Nigeria, Ghana and Congo come from Chungking Mansions. Yuet-ming Lui, a wholesale shop owner in Chungking Mansions, says the reason why this business is thriving is that in Hong Kong Africans can access the cheap manufactures of the Chinese mainland, while enjoying greater levels of flexibility than if they were buying products directly from the factories. "In China, there is a minimum of products that you can buy from a factory," says Lui. "Here in Chungking Mansions, businessmen can buy from one to 10,000 mobile phones, they can have product guarantees and enjoy credit if they become regular customers of a shop." But there is another, less publicized face of the trade between Hong Kong and Africa. According to Siddiq, a growing number of Africans profit from the size of Hong Kong's jewelry and stone market to sell such precious minerals their mother countries abound in: gold, diamonds, gems, and also metals like bauxite and lead. "Export of gold and precious stones is often illegal in the country of origin," explains Siddiq. "So many businessmen smuggle the minerals out of Africa illegally, and regularly declare the goods in Hong Kong, where the trading of these products is legal." One of these traders is Chama Kanos, a Tanzanian who has been in the gem business for more than 10 years. He sells moonstone, a silicate gem that is mainly used in ornaments and jewelry. "After being polished, this stone has a unique blue shine that looks amazing," says Kanos, proudly, while showing an unrefined piece in his hands. As moonstone export is not illegal in Tanzania, Kanos sells big quantities, shipping around 100 kilograms of moonstone to Hong Kong each time. Depending on the conditions of the market, a 100kg lot can fetch $3,000 to $4,000. The moonstone is then bought by mainlanders, who refine it on the mainland and sell the finished product back in Hong Kong. According to Kanos, doing business with the locals has been difficult in recent times due to the financial crisis, but things are moving towards the better. "In the past, Chinese used to be diffident towards African businessmen and did not treat us as equals," says Kanos. "But now things have improved, people realize that we bring valuable goods to the market and welcome us to make business with them." Siddiq shares the same mild optimism, and ensures the recent creation of the African Committee of Hong Kong will help facilitate business and cultural exchanges between Africans and Chinese in the city. "I think local Chinese are starting to understand us," says Siddiq. "I believe in the future Africans will do more and more business with Hong Kong." Hopefully, Africans in Hong Kong will not have to wait for the next World Cup before they can celebrate new achievements.